Gap trading is one of many trading strategies based on technical analysis, which is very simple to trade and can be very profitable, but it requires discipline. Gap trading is a simple and disciplined approach to buying and shorting stocks, which is based on technical analysis (chart analysis). A gap in a chart is essentially an empty space between one trading period and the previous trading period; more precisely, a gap is a change in price levels between the close and open of two consecutive days. They usually form because of an important event that affects the security; for example poor earnings, bad news, organizational changes and market influences can cause a stock's price to drop uncharacteristically. 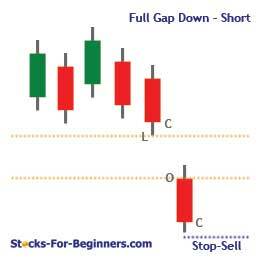 Gap price movements can be found on bar charts and candlestick charts but will not be found on basic line charts; as you probably know, basic line chart only connects everyday closing prices, while bar and candlestick charts present other important information, like open, high and low of the period. You can read more about how to read different types of stock market charts in separate article. For example, if the price of a company's stock is trading near $98 and the next trading period opens at $88, there would be a large gap down on the candlestick chart between these two periods, as shown by the figure below; by the way, on the chart bellow you can find part of historical price movement of Canadian company Research In Motion (RIMM) - known by Blackberry business mobile phone, which is a technological stock and for this sector gaps are very common. It is often said when referring to gaps that they will always fill, meaning that the price will move back and cover at least the empty trading range. This is also known as closing the gap. However, before you enter a trade that profits the covering, note that this doesn't always happen and can often take some time to fill. There are four main types of gaps: common, breakaway, runaway and exhaustion. They are all the same in structure, differing only in their location in the trend and subsequent meaning for chartists. The common gap is usually uneventful. They can be caused by a stock going ex-dividend when the trading volume is low for example. These gaps usually get filled fairly quickly. This type usually occurs after a consolidation or some other price pattern. 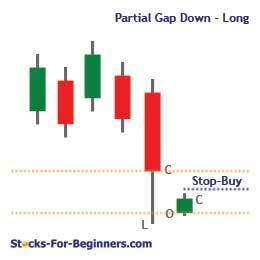 A stock will be trading sideways and then all of sudden it will "gap away" from the price pattern. Sometimes called runaway gaps or measuring gaps, these occur during a strong advance/decline in price. This type of gap occurs in the direction of the prevailing trend and represents the final surge of buying or selling interest before a major trend change. 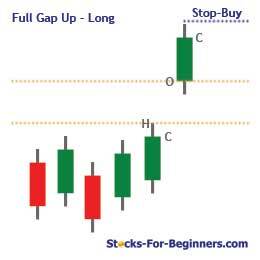 A Full Gap Up occurs when the opening price is greater than yesterday's high price, while Full Gap Down occurs when the opening price is less than yesterday's low. A Partial Gap Up occurs when today's opening price is higher than yesterday's close, but not higher than yesterday's high, while Partial Gap Down occurs when the opening price is below yesterday's close, but not below yesterday's low. The difference between a Full and Partial Gap is risk and potential gain. In general, a stock gapping completely above the previous day's high has a significant change in the market's desire to own or sell it. Full gapping stocks generally offer greater opportunity for gain over several days than stocks which only partially gap. 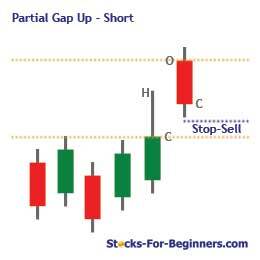 Gap trading strategy is quite simple and can be applied to weekly, daily or intraday gaps. When you find a stock that has a price gap from the previous close, you should watch the first hour of trading to identify the trading range. Rising above that range signals a buy, and falling below it signals a short. In order to successfully trade gapping stocks, you should use a disciplined set of entry and exit rules to signal trades and minimize risk - gap trading rules. 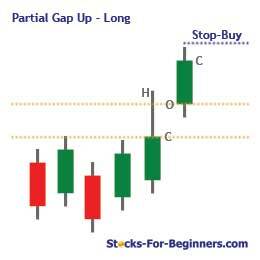 There are eight gap trading strategies defined by full or partial gap, gap up or gap down and price range in the first hour of trading. We have categorized them in long and short gap trading strategies and sorted them by their power - the strongest ones with the highest potential/risk ratio are presented the first - full gaps are more powerful than partial and trading in the direction of gap is less risky than trading contrarian gap trend. When reading the setups, you will see the term 'Tick', which is defined as the bid/ask spread and is different from stock to stock. If a stock's opening price is greater than yesterday's high and after one hour of trading the price is still above opening gap price (green candle), set a long (buy) stop order two ticks above the high achieved in the first hour of trading. If a stock's opening price is greater than yesterday's close, but not greater than yesterday's high, and after one hour of trading the price is still above opening gap price (green candle), set a long (buy) stop order two ticks above the high achieved in the first hour of trading. If a stock's opening price is less than yesterday's close, but not lower than yesterday's low, and after one hour of trading the price is above opening gap price (green candle), set a long (buy) stop order two ticks above the high achieved in the first hour of trading. If a stock's opening price is less than yesterday's low and after one hour of trading the price is above opening gap price (green candle), set a long (buy) stop order two ticks above the high achieved in the first hour of trading. If a stock's opening price is less than yesterday's low and after one hour of trading the price is still below opening gap price (red candle), set a short (sell) stop order equal to two ticks below the low achieved in the first hour of trading. If a stock's opening price is lower than yesterday's close, but not lower than yesterday's low, and after one hour of trading the price is still below opening gap price (red candle), set a short (sell) stop order two ticks below the low achieved in the first hour of trading. If a stock's opening price is greater than yesterday's close, but not greater than yesterday's high, and after one hour of trading the price is below opening gap price (red candle), set a short (sell) stop order two ticks below the low achieved in the first hour of trading. If a stock's opening price is greater than yesterday's high and after one hour of trading the price is below opening gap price (red candle), set a short (sell) stop order two ticks below the low achieved in the first hour of trading. If you will check a few historical charts and search for gaps, you will notice that gaps are most often established on very high above average volume. This means, that institutional traders and professionals are leading the game, which is a very strong indication of continued movement in the same direction of the gap. On the other side, if gap is established on low or normal volume, you should be especially careful when trading partial gaps; be more conservative in your trading strategy and wait until the price breaks the previous high (on a long trade) or low (on a short trade). Another factor to watch with gaping stocks is support/ resistance levels. 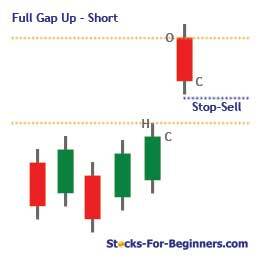 A gapping stock that crosses above resistance levels provides reliable entry signals. 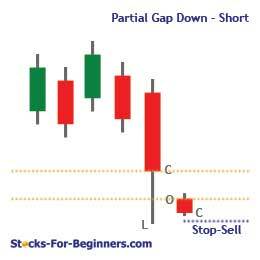 Similarly, a short position would be signaled by a stock whose gap down fails support levels. It is also important to look at the longer term charts of the stock to know where the long-term support and resistance are. More aggressive gap trading strategy can be applied to all eight full and partial gap scenarios above, the only difference is that instead of waiting until the price breaks above the high (or below the low for a short) you enter the trade in the middle of the rebound; you should set a long stop (short stop) order equal to the average of the open price and the high (low) price achieved in the first hour of trading. If you would like to trade gaps based on this method, be aware that stock should be trading on at least twice the average volume for the last five days. Besides, this method is only recommended for those individuals who are proficient with the eight strategies above, and have fast trade execution systems. Since heavy volume trading can experience quick reversals, mental stops are usually used instead of hard stops. Like with any other trading strategy, you can never be 100% sure that something will work like you think it should and the only thing you can control is risk, not return. Therefore you have to protect your losses; otherwise you will be out of the game to soon. We have written an e-book about most common mistakes people make when trading or investing. I recommend you to get your free copy of this e-book here: 22 Most Common Mistakes You Must Avoid When Investing in Stocks. Basis of risk management are stop-loss orders. Once you enter a position, you should calculate and set an 8% trailing stop to exit a long position, and a 4% trailing stop to exit a short position. A trailing stop is simply an exit threshold that follows the rising price or falling price in the case of short positions. Entering a trade for a partially gapping stock generally calls for either greater attention or closer trailing stops of 5-6% for long positions and 2-3% for short positions. Example: If you buy a stock at $100 you should set the trailing stop order 8% below the buying price, at $92. If the price rises to $120, you raise the stop to $110.38, which is approximately 8% below $120. The stop keeps rising as long as the stock price rises. In this manner, you follow the rise in stock price with stop that is executed when the price trend finally reverses. The same - just turned around - risk management should be done when you are shorting a stock. 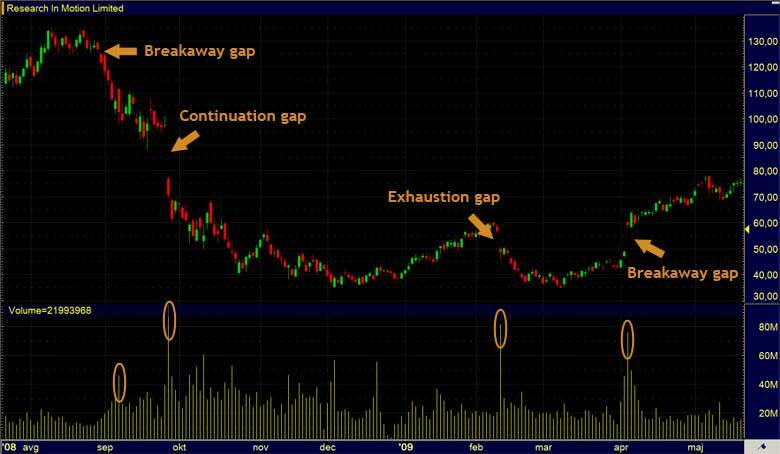 Where Do I Find Gapping Stocks? 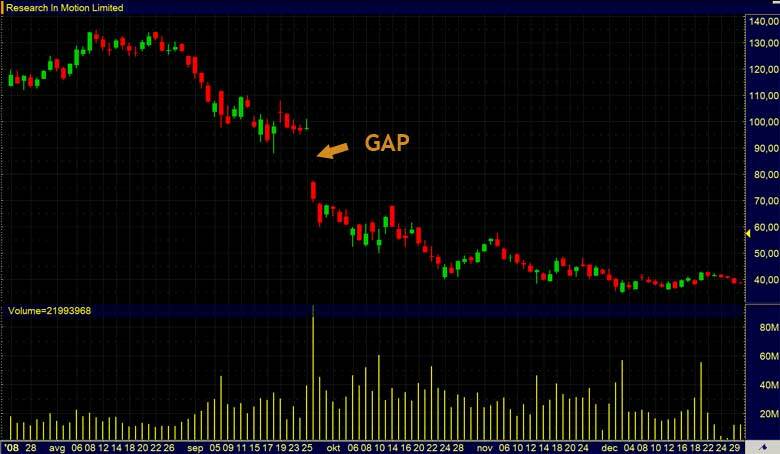 Is Gap Trading Strategy Profitable? 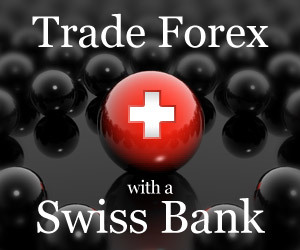 Gap trading strategies are a rigorously defined trading system that uses specific criteria to enter and exit. Trailing stops are defined to limit loss and protect profits. The simplest method for determining your own ability to successfully trade gaps is to paper trade.